1 wall rail (2-bay) and 1 system case plus 4 one-piece units, 1 single drawer and 1 double drawer. This innovative workshop system as an extremely well-priced starter set. For power tools, hand tools, all types of aerosol silicone, accessories and so on. BluCave is an affordable premium series consisting of modular and combinable machinery products, storage products and complementary accessories. Create a professional workshop, a personalised workspace or even a versatile tidying and storage system for your home. The choice is yours - choose the products you need or collect the whole product range! Versatile system case that is portable and can also be attached to the BluCave wall rail. The rail can hold up to two system cases. 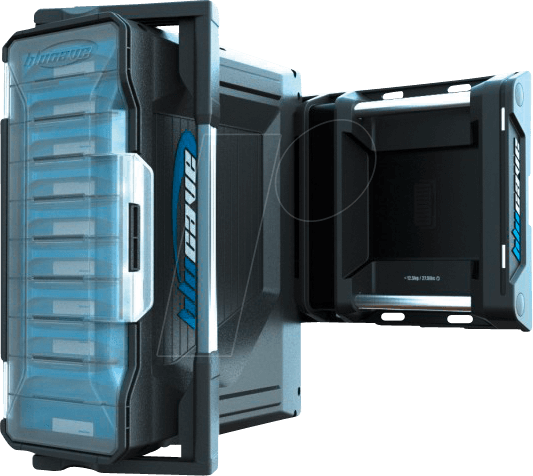 Attach it to the wall, use it to hang the system case and boosters, add a shelf - the storage options are endless!